Beach Eats! 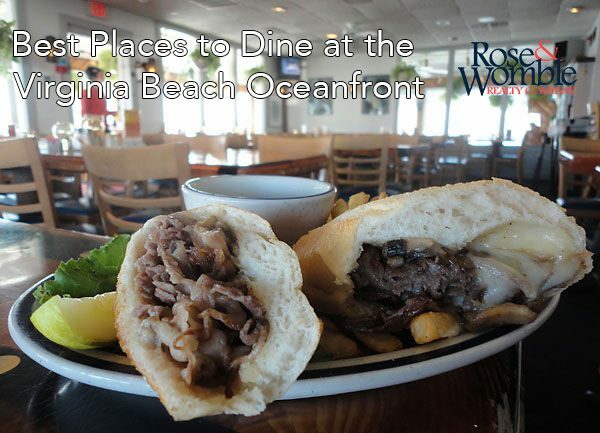 Best Places to Dine at the Virginia Beach Oceanfront - Rose & Womble Realty Co.
Virginia Beach is a saltwater haven for locals and tourist alike. With miles of stretching sandy beaches, a lively night life, dozens of family friendly activities and an abundance of water sports, there’s a lot to love about Virginia Beach, especially the food! I’ve been a Virginia Beach resident for about ten years and the food found in this city is one of the best parts about living at the beach. From Rudee’s inlet to 40th street, there’s a bunch of fun local spots to check out during your time in Virginia Beach. If you’re looking for delicious, fresh caught local seafood and a fun and unique atmosphere, check out the cabana bar at Rudee’s. Rudee’s has been a Virginia Beach staple for over 35 years and has even been featured on the Food Network. The cabana bar, located outside directly in front of the Rudee’s building, is known for its one-of-a-kind gliding booths, rock back and forth right on the water while enjoying jumbo shrimp cocktail and one of Rudee’s famous “docktail’s,” The Rudee’s Ruckus. Big Sam’s Raw Bar is right down the road from Rudee’s and it’s a personal favorite of mine for breakfast. There’s nothing quite like starting your day with one of Big Sam’s giant award-winning pancakes and the picturesque water view from just about every seat inside the small restaurant. Big Sam’s is also know fondly for its happy hour every day from 3pm-7pm where guests can enjoy a cold beverage, $0.69 cent clams and $1.19 oysters! 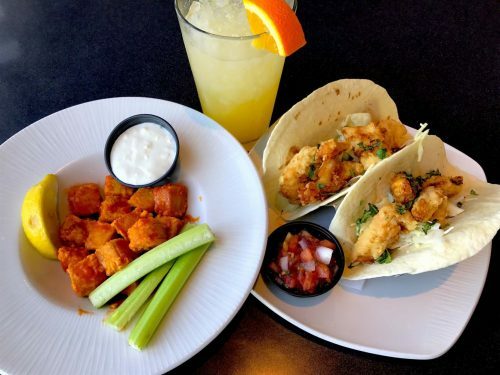 Waterman’s is known for its mouthwatering food and orange crushes. 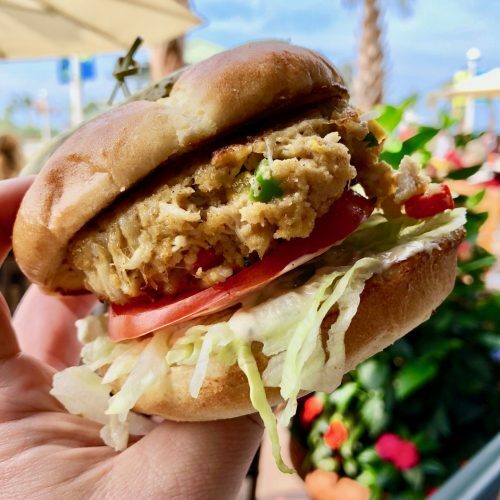 Located at 5th street, right on the boardwalk, this family friendly restaurant turns into a great local spot at night for socializing and date night. Waterman’s has a wonderful valet service, a cute store inside and two fun bars to try one of those orange crushes at. 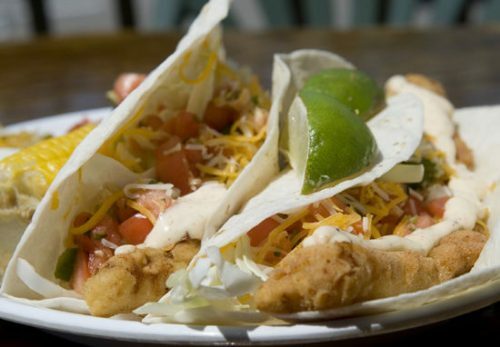 You can’t go wrong with a trip to 5th street to check this local hotspot out. Mahi Mah’s is just a jump down the road from Waterman’s on 7th street. If you like local seafood or sushi, check this place out. Mahi Mah’s is a good choice if you’re out on the weekend and looking to hear some live music. Just outside it’s patio is the 7th street stage which has a band every weekend during the summer. Grab some sushi and a seat outside and enjoy live music in front of the beautiful backdrop of the Atlantic Ocean. Il Giardino Ristorante is an upscale Italian restaurant right off the boardwalk that will not disappoint. The entire menu is made from scratch with Il Giardino’s handpicked chefs and the wine selection is vast, sure to appeal to everyone. This is a wonderful choice to celebrate a birthday or anniversary with friends or family. Baja Cantina on 23rd street is a perfect spot if you want something casual, local, delicious and you love tacos. Baja tacos are the best in Virginia Beach and all their homemade hot sauces are equally delectable. The lobster tacos are incredible, and their shrimp tacos come in a close second. These tacos are big though, two should go a long way for anyone, fair warning! Doc Taylors is a must visit breakfast spot at the Virginia Beach oceanfront. Former old house turned locals favorite, Doc’s is on 23rd street across from Baja Cantina. Open from 7am- 3pm, I’d suggest getting there early because there is always a well-deserved wait to get in this popular place. Doc Taylor’s aims to make “food that satisfies the soul,” and they do a wonderful job of that. Don’t leave the beach without taking a seat around one of Doc Taylor’s tables. Catch 31 is a fine dining, fun atmosphere with great food and signature cocktails. This is a popular spot for locals to have a drink after a long work week. Located on 31st, on the first floor of the Hilton, Catch 31 is known for its fire pits and view of the 31st stage which hosts popular bands on the weekends. The restaurants on Virginia Beach’s boardwalk have something for everyone, whether you’re a local or a first-time guest to this gorgeous city. Happy eating!